Well, I look forward to trying it out. The unlimited levels will certainly be useful for the hotlist menu, even if it means re-writing the entire menu construction code. Again. hmm where's the X1000 kink over at Amigakit?? Please don't call Matthew a kink, that's not nice. Last edited by nbache on 19-Dec-2014 at 11:48 PM. Last edited by Kicko on 19-Dec-2014 at 11:57 PM. Last edited by amigakit on 19-Dec-2014 at 11:58 PM. Last edited by amigakit on 19-Dec-2014 at 11:57 PM. Just ordered the X1000 version for myself & the 440EP version for a friend. Last edited by kyle on 20-Dec-2014 at 07:26 AM. Last edited by klx300r on 24-Dec-2014 at 05:24 AM. Only one question...why cant order a digital copy before the phisical? With a delivery delay be course of work.. 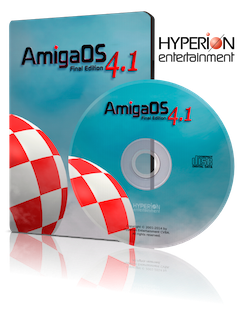 Ordered AmigaOS 4.1 FE for my X1000. Last edited by nightwing on 23-Dec-2014 at 06:55 AM.